20171115 Finally got a chance to do some portfolio work for my good friend Woz! Yet another work in progress for a story which started off exploring food waste, and has grown into a larger project of sustainability and the necessary cycles within our own human ecosystem. 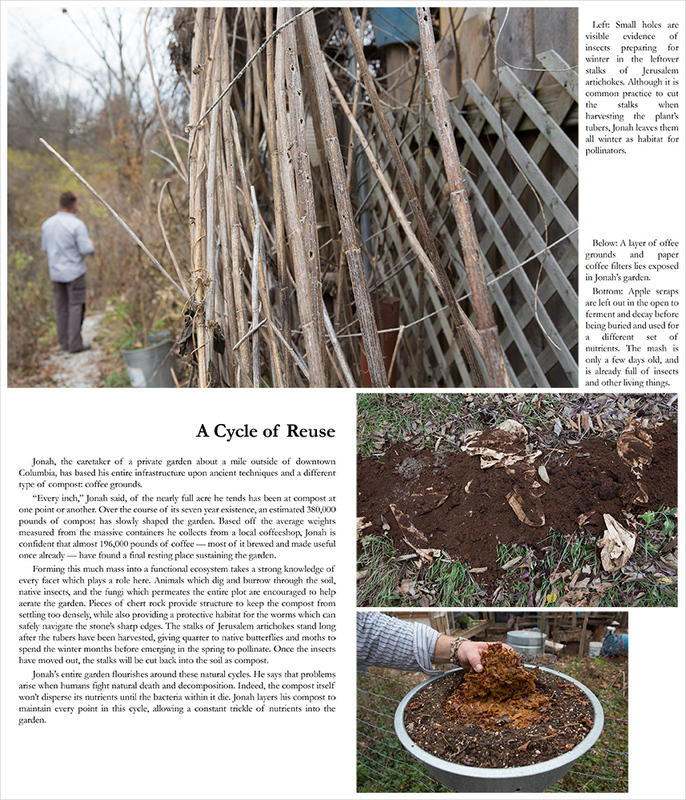 These are stories of people doing their part to help the cycle along. I took a sideways step in my ongoing project exploring constructive uses of food waste in going to a massive private garden, tended and sculpted and built up for the last seven years by Jonah. 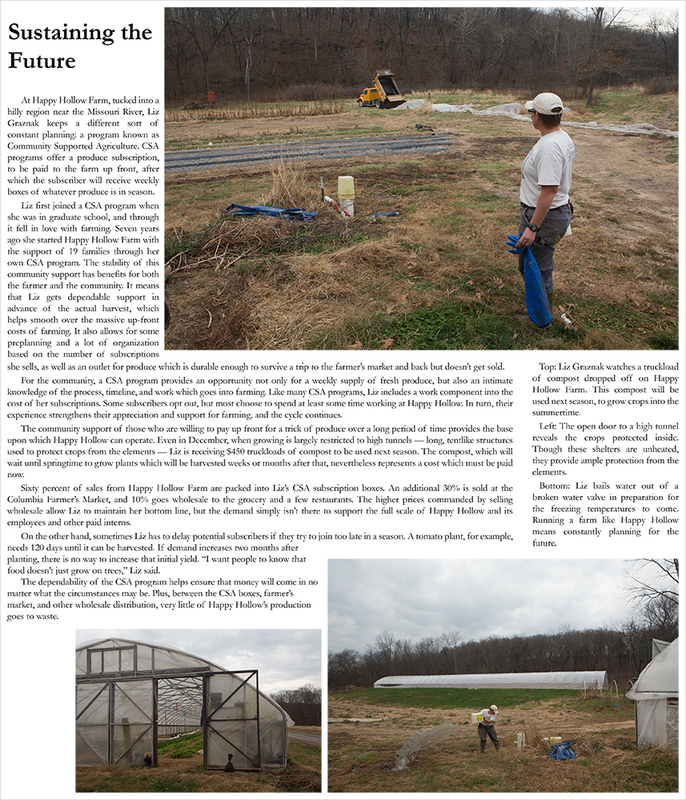 The plot, just shy of an acre near downtown Columbia, rests entirely on layers of compost and biomass fill and chert rock, with literally hundreds of thousands of pounds of compost laid down since Jonah began his work. The main reason I wanted to photograph this garden, though, is a massive percentage of the compost Jonah uses is coffee grounds: an inedible byproduct, put back to work in a different way. I didn’t get as much work done over the Thanksgiving holiday as a perhaps should have, but I also experienced my first true days off in several months and I welcomed the break. Now, I’m racing to one imposed deadline for this project before I will be able to reanalyze it once more and alter its course as winter comes in full force. It’s still fairly warm in Missouri, and this fact combined with the daytime heat retained by Jonah’s chert rock and the heat given from the compost as it decomposes allows new leaves to bud even as we approach December. It’s honestly a beautiful sight to see, but I know my emphasis will change as food production slows. We will enter a chapter of conservation until springtime comes. With this knowledge, I am viewing the upcoming end of semester as a deadline point, but no longer the end of this project. I’ve been learning so much about reuse that stopping now, just as winter is coming, would feel distasteful. Jonah taught me about the insects that inhabit small holes in his Jerusalem Artichoke stalks, which he leaves intact simply for habitat after the food is harvested. They will spend the winter in the garden which they will pollinate in the spring. How could I leave the cycle now?